MARTINEZ, Calif. — After an overwhelmingly sad court hearing in which family members memorialized two men and two boys who were killed in a 2017 drunken driving crash, a judge gave the driver a sentence that virtually guarantees he will die in prison. Fred Lowe, 49, was sentenced to 135 years to life Friday for the murders of Daryl Horn, 50; his 14-year-old son, Joe Horn; Daryl’s brother-in-law, Troy Biddle, 52; and Troy’s son, Baden Biddle, 13. Troy Biddle was a Seattle attorney who graduated from Astoria High School in 1983. Lowe had no connection to the victims; he simply swerved his car into theirs, causing it to flip over a center divider and wreck, after he allegedly consumed 13 alcoholic drinks. The lone survivor of the SUV was the driver, Daryl’s son, Jared Horn, a well-known college baseball player at University of California, Berkeley. Lowe was convicted of murder, driving under the influence and hit and run in March, after a jury trial. 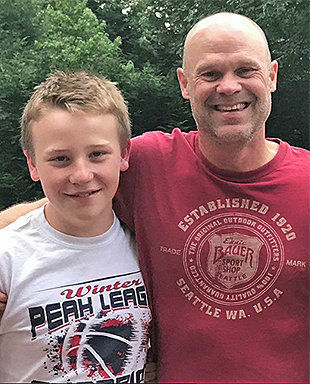 Lowe’s case was the source of outrage all over the Pacific Northwest; around 1,500 people attended memorials for the victims in Washington state and Oregon — where Daryl and Troy are from — as well as the Bay Area. Todd Biddle, Troy’s brother, talked about a family road trip to watch a college football game in Eugene, and how Baden eagerly talked about all his Saturday picks on the way up. He read something his brother had written about grief, that scars are tougher than the tissue they are replacing, but that they always remain. Judge John Kennedy said he was imposing the harsh sentence because there were four victims, and the defendant had numerous chances to stop endangering other drivers. He said the defendant had displayed no remorse, had violated parole seven times and racked up a total of 15 misdemeanor and felony convictions over the years, including assault, robbery and five driving under the influence ones. “The DMV suspended his license 11 times. .... That did nothing to stop him from driving. He didn’t even attempt to reinstate his license; he just kept driving,” Kennedy said.